… it’s the BIG one!! The NYE ? dream ? has finally arrived.
? PARTISAN NYE PARTY ? !! Because a house party would be underwhelming ? A club night feels wrong ? But the NYE community party is just right ??? ? WITH A 6AM LICENCE ???
? ? ? ? ? ? ? ?️‍? ? ? ? ? ? ? Proper party music all night long! Expect: disco / house / garage / techno / bass / grime / rave / more ! As a longtime no.1 fan of the Partisan dancefloor, the man with more UK garage records than he can carry will finally be let loose behind the Partisan decks. Enormous creativity and technique means you never know what genre is gunna come next with Alex – just take comfort in knowing that it’s gunna make you shake a leg. Take a listen here. 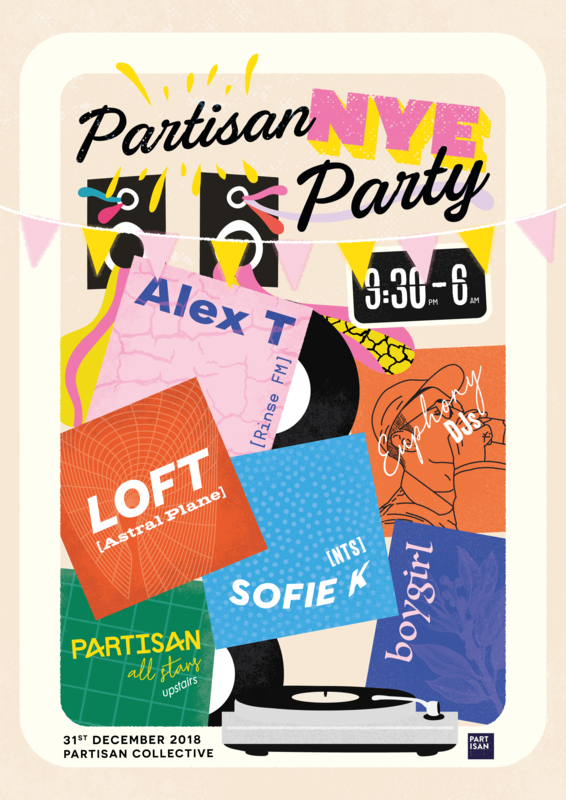 None other than the hottest disco selector in town, Sofie K returns to set the Partisan dancefloor alight again and burn away 2018. Boogie, italo, synth pop, and cosmic disco inside – here. Not only are we bringing LOFT, but the incredible queer collective she forms a part of: Boygirl. With a slew of MCs and DJs who are all phenomenons in their own right, Boygirl are perhaps the most exciting performance in Manchester dance music. Let them take control of the room, and set the party loose with boisterous glamour. Harmonising queer classics and grimey wheel ups, it’s their beloved hot mess. They specialise in pulling it off, and pulling it up. Stalwart residents of the longstanding Euphony party, George & Ed are artful masters of getting the party properly started. Catch George alongside Partisan favourite Tom Boogizm on NTS earlier this year – here. Partisan All Stars chill-out room – all night long ?? ? Snuggle up, settle in, and conk out. The most relaxing spot in Manchester opens its arms and welcomes you in. Careful you don’t get too cosy though – the dancefloor is downstairs!